Use for meetings, classroom testing, or buffet tables. The possibilities are endless! Seats 4-8 guests. 30" leg height. Use a 90" x 156" linen (3" puddled to floor) for a beautiful touch. 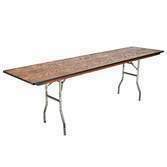 We have chairs & tablecloths to complete your table. Linen Poly Royal Blue 90" X 156"